Thanks to those of you who joined us for our last film club viewing and discussion of ON THE ROAD. 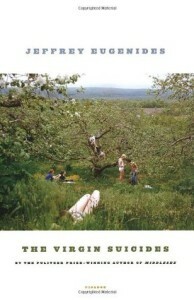 Our next YPG Book to Film Club selection is THE VIRGIN SUICIDES by Jeffrey Eugenides (Farrar, Straus and Giroux, 1993). Eugenides’s chilling debut novel centers on the lives of five sisters in Grosse Pointe, Michigan during the 1970s. The Lisbon girls fascinate their community as their neighbors struggle to find an explanation for their acts. The 1999 film was directed by Sofia Coppola and stars Kirsten Dunst, Josh Harnett, and James Woods. The viewing and discussion will take place on Wednesday, August 20th from 7:00-9:00pm at Macmillan (Flatiron Building, 175 Fifth Avenue, 17th floor conference room). You must sign up to attend, so RSVP HERE. Pick up your copy of the book now and see you there!